Will fit in some halls and gardens. Suitable for indoor or outdoor hire. LOTS OF CHILDREN???... Then this assault course is the one for you!!! Under the sea themed, Perfect for a mermaid or pirate themed party!!! Full of bish bashers and finished off with a climbing wall and slide!!! This show stopping assault course is the biggest WOW factor for any celebration or event. Suitable for children up to 1.5m tall. 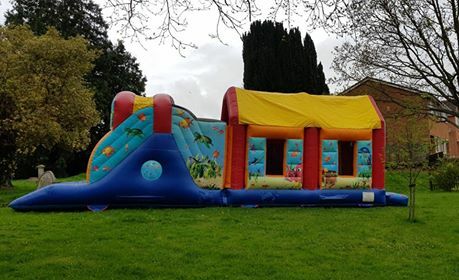 Matches our 12 ft x12 ft Under the sea bouncy castle... both together make the ultimate any age children’s party!! !